BITCOIN & Crypto Pullback -- What's It Mean?steemCreated with Sketch. Happy Monday -- welcome to the dump! This was a little unexpected. 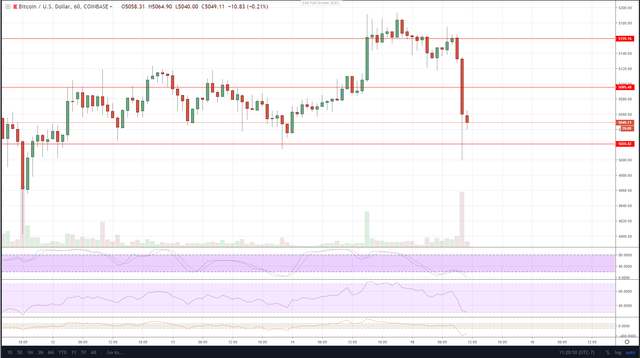 BCH was initially rallying over 15% and now we see the markets just taking a dive. This was assumed to be the scenario though if the bulls showed up. Unfortunately, all of the recent supports have broken. This makes the short term trend broken, despite recently making a new higher high. The good news is that on the 15-minute chart and greater, we're still holding a higher close. So, there's hope in that regard. I'll make a post on the weekly in a little bit, but look at the weekly chart. We can see we had the bearish spinning top reversal doji come after 7 weeks of bullish upside. This was expected as well from such a long run. I think we might be looking at an additional bear week this week. For now, it's still an inside bar on the weekly which isn't a bad thing at all. Signs for weekly are pulling back though. Hope you all had a great weekend and are staying safe! !